Last year the U.S. Congress’ Committee on Oversight & Government Reform held a hearing. The buzz on the web was that this prompted by lobbying by people and groups who promote the idea that vaccines have caused the rise in autism diagnoses. In other words, the hearing was supposed to be a hearkening back to the “good old days” when the Committee under Dan Burton held hearings promoting the idea that vaccines cause autism. Instead, the hearing became “1 in 88 Children: A Look Into the Federal Response to Rising Rates of Autism“. The hearing originally did not include autistic representation but, after a phone/fax/email campaign, that changed. Ari Ne’eman of the Autistic Self Advocacy Network and Michael John Carley of GRASP were invited to speak. The Committee then were presented with the false dichotomy of “Parents who believe in the vaccine epidemic” vs. “Autistics who don’t and want a focus on improving the lives of autistics”. Also a long session where Members of Congress berated government public health employees. All in all a waste of my tax dollars, if you ask me. The people who lobbied for the hearing apparently were not pleased with various aspects of the hearing. The buzz has been building that another hearing is in the works. We were told that $40,000 had been donated the Political Action Committee (PAC) for the chair of the Oversight committee, Darryl Issa. The original source for that information (Patrick “Tim” Bolen) is far (far, far, far) from reliable. Also, there are limits on campaign donations and it seemed unlikely to me that $40k could be donated to his PAC. But, with the chatter rising on the hearing to the point that people are claiming it is scheduled for November, I thought I’d check. Notice that the first hearing has been redefined. It wan’t about autism. I suspect in her view it never was. And that is sad. Last year’s hearing and the proposed hearing this year are about vaccines. Last year’s hearing was preceded by donations from Gary Kompothecras (a Florida chiropractor) to Congressman Issa. Mr. Kompothecras was pictured at the hearing. If internet reports are to be believed, it appears that Mr. Kompothecras is part of the groups that split after the hearing last year. 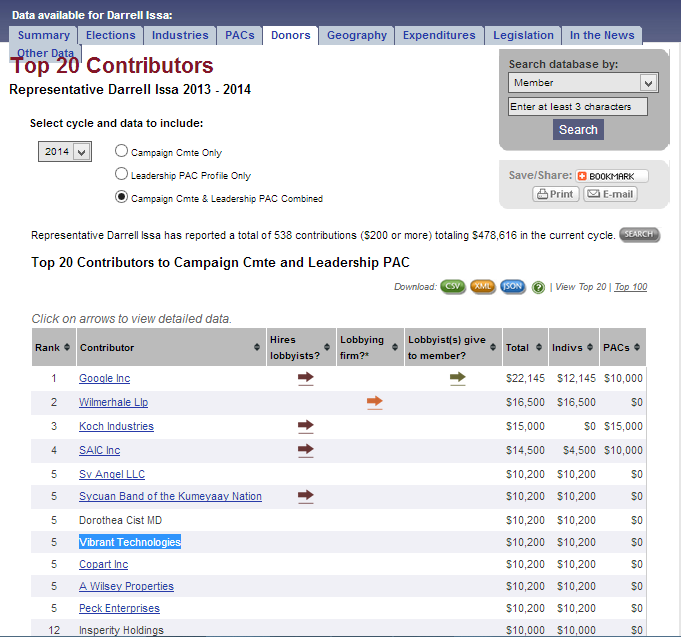 He has not donated this year to Congressman Issa or others on the committee. He and his wife did donate last year, about the time that it was reported that Congressman Issa agreed to hold the hearing. If the buzz is correct, a hearing will be held soon. It won’t be about autism (and, thus, parents can be in the spotlight without sharing it with those inconvenient autistics). But, as we’ve seen, last year’s hearing wasn’t about autism either, right? Did last year’s hearing have any impact on the lives of autistics? Can I say that my kid will have a better future because of that hearing? No. Absolutely not. Has congressman Issa joined the Congresional Autism Caucus? No. Has he sponsored or supported autism-relevant legislation? No. We have three bills, stalled in committee, one of which is a vaccine-study bill. None have his support. And this year’s hearing will be even less relevant. Wow…and here I was thinking that Larson’s contributions to Darrell Issa was to convince him to attend the Autism One-Generation Rescue Convention and participate on the their Congressional Panel. So, a day after Larson made two separate donations totaling $ 5,200, directly to Issa’s campaign committee and washed through her company, he agreed to appear on that Panel. What a coincidence. Is it also a coincidence, that Larson was able to inform her constituents that Issa’s Committee has scheduled a vaccine hearing for November, 2013, after making a huge donation to the RNC? With an investment of only $40,000, birthers, truthers, or believers in the Loch Ness Monster could similarly buttress their position: Certainly no Congressional subcommittee would hold a hearing if the (paid-for) position wasn’t credible! Pales in comparison to the millions of dollars the pharmaceutical industry has given to Congressional Republicans and Democrats to include a liability exemption for vaccine manufacturers. What’s your point, industry donations are less ‘corrupting’ than individual donations? I never made a comparison to industry donations. But if you feel the need to project a point on to me, feel free. Elsewhere. Let’s see if we can draw a lesson from this. 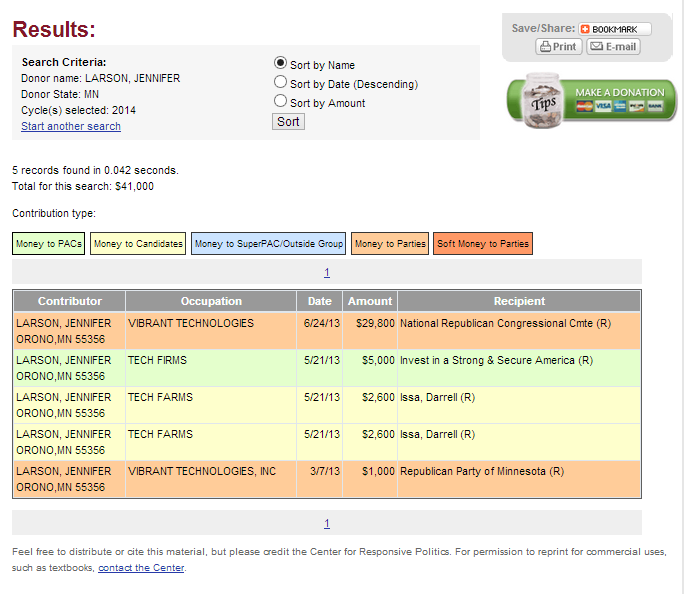 Member of tiny political group pays money to a politician. Happens every day. Politician shows up at parent convention and holds hearing–but does nothing for the community. It’s all PR. Nothing new here. It’s all about vaccines, not about autism or helping the autism communities. Again, not new. That’s what the Canary Party is all about. Very straightforward. If you read what I wrote. Which you don’t. Nothing new there either. Tu Quoque. The spectre of industry lobbying wasn’t raised. Furthermore, you are incorrect about a liability exemption, on the contrary NVICP was an addition to allow those injured by vaccines to get quicker relief and access to that relief by also allowing for legal and expert fees. Wrong. The NVICP is funded by a $0.75 to $2.25 excise tax on vaccines. The manufacturers are exempt from any liability related to vaccine injury thanks to the Congress and political contributions from the pharamaceutical industry. How is your response an answer to the statement by Science Mom? Stating that there is a program in place to compensate people does not mean that there is no liability. Did I state that the awards are not funded by an excise tax on vaccines? I seem to recall correcting you on the terminology a while back, where you claimed it was not a tax. It is a 0.75 tax per dose. The compensation is paid from the excise tax. Is the program itself? E.g. salaries and overhead for the special masters, personnel at HHS, etc.? That was not my understanding. The manufacturers are not exempt from any liability due to vaccine related injury. Perhaps you could do your own research rather than reading dubious websites? They are liable for failure to warn and for manufacturing defects. The Court of Federal Claims is the *first* place someone must take their case (if they are asking for >$1,000. Under that and they can go directly to civil court). (2) to file a civil action for damages for the alleged injury or death. The language is clear. One can set aside the judgment of the Special Master and file a civil action. The manufacturers are exempt from any liability related to vaccine injury thanks to the Congress and political contributions from the pharamaceutical industry. I’m sorry you thought the Canary Party video was real. Petitioners to the NVICP must simply go through that process first but they can then reject the decision and sue manufacturers directly. Given there was at least one lawyer consulting on that ignorant video, it’s obvious he is too unethical or incompetent to convey this and also discuss how the NVICP system very much favours the petitioner over a full tort process. Poor Dachelbot has got a call out to the wahbulance over your post pointing out the fact that Issa is receiving large donations from the Canary Party and is “interested” in their faux vaccine issue. He doesn’t give a toss about any of the autism bills mind you. Dachelbot also doesn’t seem to get that people don’t tend to use their own money for their campaigns so his personal wealtlh is moot. Good to know she reads this site. I can’t say I return the compliment. Let me know how it turns out over there.